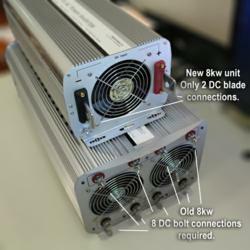 TheInverterStore.com launches a new power inverter to help humanity continue its current trend — shifting toward use of renewable energy resources and achieving independence from big oil. Other improvements to this new 8000 watt inverter manufactured by AIMS Power include: 1, DC inputs that are simplified to one set of cables, rather than four, making for an easier and cheaper install; 2, improved DC terminal blocks to ensure that the inverter handles the full 8000 watt capacity guaranteed; 3, a redesign of the inverters’ AC outlets, which were changed from a cluster to a strip layout for better functionality when using atypically shaped plugs; and 4, a single fan system, as opposed to a dual, which makes the inverter much more quiet — virtually inaudible — during use. The biggest obstacle people face when using an inverter is the wattage startup surge of the tools or appliances being ran, but this 8000 watt model can handle any locked rotor startup (LRA) surge under 66. This means it can handle the wattage needed to power things like air conditioners and air compressors. Another advantage for vehicle upfitters is that the inverter funnels 12 volts of DC, because that means the unit can run of any standard vehicle’s battery system. This perk also comes into play for recreational and emergency backup power applications. Since most RVs and boats use a 12 volt battery system as well, this new 8000 watt 12 volt power inverter is perfect for making aftermarket upgrades such as a stereo system or heated seats. Emergency backup power is another huge selling point for this product, especially since you can hook it up to your car’s battery system right out of the box and have a full-blown, off-grid power system. Doing our part to help reduce environmental footprints worldwide by selling DC to AC power inverters, inverter chargers, solar panels, solar charge controllers (MPPT & PWM), batteries, cables, transfer switches, fuse kits, & power accessories — everything needed to create & sustain a mobile and/or off-grid power system. The Inverter Store prides itself on customer service, treating every customer with the utmost respect & courtesy, because creating a power system can be a hefty task. A big point of emphasis for The Inverter Store is commitment to technical support, whether that means providing solutions to problems for current or potential customers. TheInverterStore.com has opened all platforms of communication possible to ensure that it’s the most accessible company on the web when it comes to power inverter information. Facebook.com/InverterStore, Twitter.com/InverterStore, The Inverter Store Pinterest & Google+ have all proved to be viable resources for our customers. The Inverter Store Blog contributes to the conversation as well. Inverters or inverter chargers transform direct current (DC) power, like the kind produced by batteries, into alternating current (AC) electricity that can be used to power a wide variety of appliances, tools and/or machinery from anywhere on Earth. This can also be achieved with a fuel powered generator. However, gas and diesel powered generators are a serious pollutant to the environment, producing harmful gases and toxic waste that is sometimes left onsite. It’s especially alarming because most fuel generators are being used in the more desolate places around the globe — places that should be kept beautiful and untouched by these harmful chemicals created by fossil-fuel powered generators.